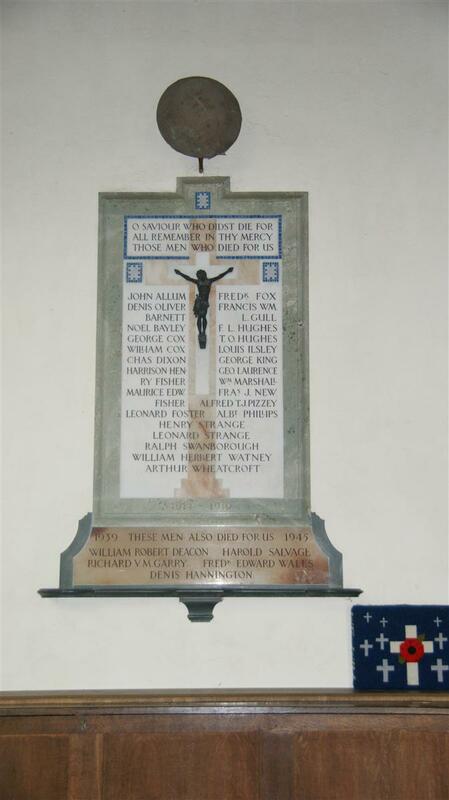 Yattendon War Memorial – Dedication Service, 16 Jan 1921. The unveiling of this memorial on Sunday was a most impressive ceremonty. Yattendon was exceptionally fortunate in securing the presence of the Rev P B Clayton, who performed the ceremony. Mr Clayton bears a name greatly loved among British soldiers, for it was he who conducted at Poperinghe the celbrated Talbot House (popularly "Toc H"). which was a centre of welcome and spiritual refreshment to many hundreds of our troops. The day began with a celebration of Holy Communion at 8 o'clock, and the actual inauguration too place duing morning prayer at 11 o'clock. After the third collect the choir and the clergy left the chancel and proceeded to the open space near the south door opposite to which the memorial is placed, and in a service of special prayer Mr Clayton, who was accompanied by the Rev A Barrington Simeon the Rector of the parish, drew the cord which held in position the Union Jack which had served as veil to the tablet. The monument is mainly of white marble, surrounded by a border of Swiss Cipollino. Let in flush upon the surface of the white marble is an alabaster cross and the names of those who lost their lives in the war are inscribed across the surface of cross and tablet alike, In the centre of the alabaster cross is again another cross is again another smaller cross of white marble and on this is mounted a bronze firure of the crucified Saviour, which was a special gift. Beneath the monument is a shelf for flowers, and above it on an iron bracket is a shrapnel helmet - an interesting counterpart to the headgear which surmounts the Elizabeth monument of Sir John Norreys on the opposite side of the church. After the unveiling Mr Clayton returned with the choir to the chancel and preached a most excellent sermon, which was listened to attentively by a large congregation among whom were many of those whose sons and relations were commemorated on the tablet. The initiation of the idea of this memorial was the work of a committee whose suggestion met with enthusiastic and general support of the parish and neighbourhood, so that the monument is in every sense a gift of the population whose offerings have fully defrayed the cost. A note has been supplied as to the symbolism of the memorial, the design of which, as will be gathered from the foregoing description, is somewhat unusual. "The association of this memorial of the repsentation of the Crucifixion in close relationship to the names of the commemorated dead, is intended to signify, not a comparison on the sacrifices of war with the sacrifices of war with the sacrifice of the Saviour - a comparison which might be irreverent - but rather a lesson which the war has taught us all as to the reality of sacrifice. The sufferings of the cross seem at times distant, remote, unrealizable. The war with its spectacle of young lives freely offered, of brave young bodies given over to our own hearts made terribly real to us all what sacrifice means, and should help us to revive our sense of the actuality of the Great Sacrifice of Golgotha. It is in that spirit, a humble and reverent spirit, that this village monument connects our thoughts of the dead soldiers with our thoughts of the Saviour. and it is in the same spirit to take into His care the souls of those who, in their degree, followed literally the Great Example."